A calanid copepod of the genus Calanus. 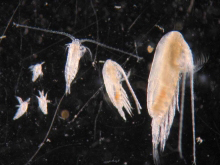 In the North Atlantic, C. finmarchicus can be confused with congeners C. helgolandicus and C. glacialis which both overlap in size and range with C. finmarchicus. It has also been mistaken for C. marshallae which resides in the northern Pacific Ocean. 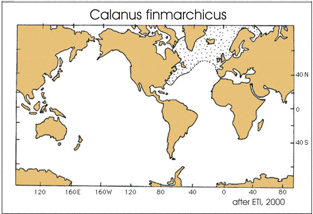 C. finmarchicus does not occur in the Pacific Ocean. 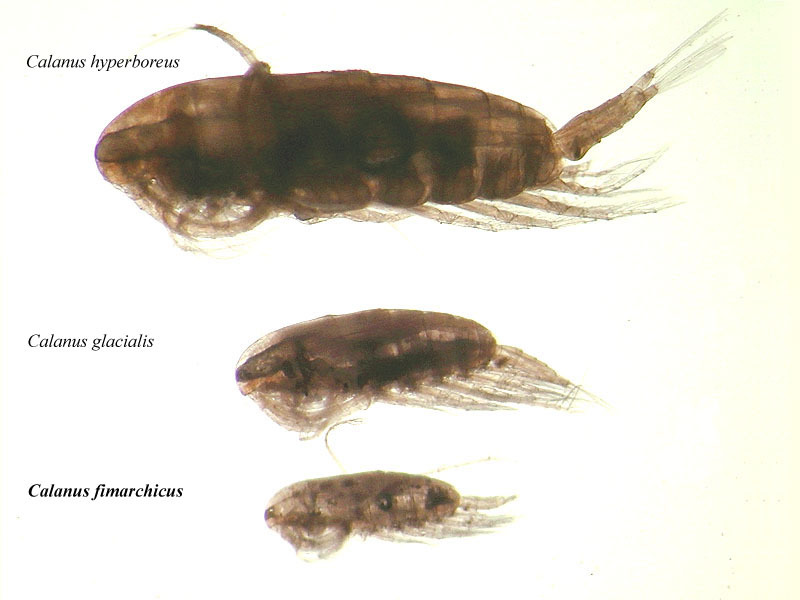 To date, C. finmarchicus specimens found in the Pacific have been incorrectly identified C. marshallae. Another species of Calanus overlapping in range with C. finmarchicus is C. hyperboreus, a significantly larger species. the less elongated outer ramus of the left last leg in the male. the female 5th leg basipod of C. helgolandicus has a curved interior margin. the more evenly rounded frontal part of the female head. the pore signature pattern of integumental organs as described by Fleminger and Hulsemann (1977). the less elongated outer ramus of the left 5th leg in the male. Sub-arctic and temperate regions of North Atlantic Ocean. Copepodite stage 5 enters diapause for the fall and early winter, remaining at depth until ready to molt into adult forms and begin reproduction.